Penetrant testing is a widely applied and low-cost inspection method used to locate surface-breaking defects in all non-porous materials (metals, plastics, or ceramics). 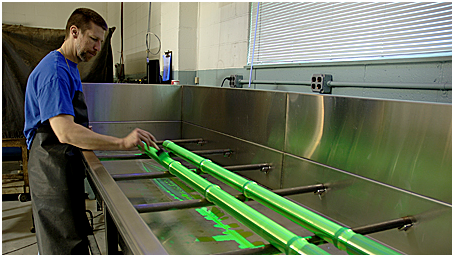 The liquid penetrant testing is probably the most widely used NDT Method. The test object or material is coated with a visible or fluorescent dye solution. The excess dye is removed from the surface, and then a developer is applied. The developer acts like a blotter. It draws penetrant out of the imperfections which are open to the surface. With visible dyes, the vivid color contrast between the penetrant and the developer makes the bleed out easy to see. An Ultraviolet lamp is used to make the bleedout fluoresce brightly, thus allowing the imperfection to be seen clearly. Penetrant testing is a widely applied and low-cost inspection method used to locate surface-breaking defects in all non-porous materials (metals, plastics, or ceramics). The penetrant may be applied to all non-ferrous materials and ferrous materials; although for ferrous components magnetic-particle inspection is often used instead for its subsurface detection capability. PT is used to detect casting, forging and welding surface defects such as hairline cracks, surface porosity, leaks in new products, and fatigue cracks on in-service components.